It has been in the low 60’s for the last few days so it is really feeling like fall. We have already had to do one round of scooping up leaves in our huge yard. The second the first leaf fell, I started sprucing things up around here with new fall decor. Welcome to my Fall Home Tour with Warm Neutral Tones. This post contains affiliate links for your shopping convenience at no cost to you. For this year, I decided to work with warm, neutral tones for a soft, cozy feel. Because my living spaces on our main floor are all so open, it was important to coordinate the decor from room to room and you will see that here. I shared details of each of these areas in separate posts that you can click on below. For this area, it was all about bringing the outdoors in. All of the branches on the table came from my backyard as did the pine cones. I love using natural elements in most of holiday decorating and this was no exception. To see this whole post with the details on how I put this together, click here. For this area, I started with decorating my buffet first. There is a beautiful story about this Haitian hand-carved urn in a previous post about how I created this vignette. I would love for you to stop and read about it HERE. I also love “spreading the love” around the room to tie everything together. This Ohara rose was hand-airbrushed and it still blows me away! Earlier in September, I hosted a luncheon which is the reason I pulled this table setting together. Since I have a large collection of the brown velvet pumpkins, I knew I would feature them on the table as well as my buffet. Adding in the white pumpkins provided a nice, clean contrast (and I could paint them another color for future uses). To see the post of this Fall Table Setting with Brown and White Pumpkins, click here. All of my fall decorating started here. I have a 16-foot island, so I usually design something large for more impact. This was so fun to pull together. You can see the whole post HERE. As you plan your fall decor, try to tie it all together throughout the different areas of your home. Decide what kind of tone you want to set and go for it! Thank you for stopping by my Fall Home Tour with Warm Neutral Tones. I would love to hear what you are incorporating in your fall decor in the comments below. Please consider subscribing to my blog to recieve instant (and free!) notifications for new posts. For more inspirations, I invite you to follow my Pinterest page on Fall and Thanksgiving Table Settings and Home Decor or Thanksgiving Table Settings. So amazing Holly! 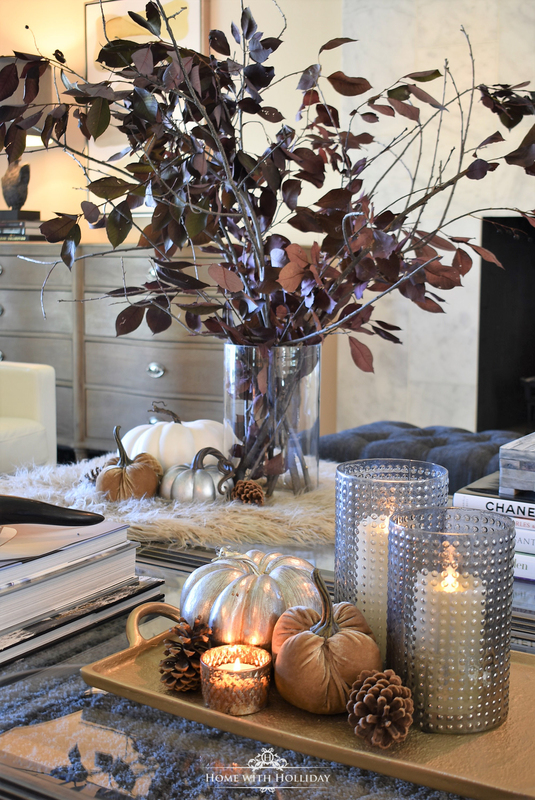 I love everything you’ve done – such an inspiration to decorate for the fall!